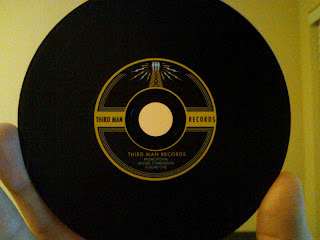 It’s an interesting task to review a promotional disc, especially a radio compilation of artists as unique and diverse as the bands on the Third Man Records roster. Since it’s a promo, it’s not a matter of recommending a purchase and because it’s a compilation, there’s no singular unifying concept or theme to latch on to. At least that’s what I initially thought. Third Man Records Promotional Singles Compilation Volume 1 gathers together all of the 7” vinyl singles (minus just a few of the b-sides) that Third Man Records released in 2009 and put them all in one place. I was already familiar with the majority of these songs on an individual level, but after listening through and trying to take it in as a whole, there was an angle that finally struck me. Showcasing all of these singles back to back is not only a cool retrospective of Third Man’s first year, it’s a testament to the variety and creativity they are pushing for. None of the artists on this compilation could be labeled as “the next (insert big band name here)” because they are each carving their own individual musical paths. The fact that most of these are stand alone singles, instead of being attached to a full album project, allows for the “no strings attached” pressure free vibe that birthed some of the most interesting and inventive music of 2009. Since last year was such a busy time for The Dead Weather, and maybe because Third Man is Jack White’s baby, they get 6 of the cuts. Three of the songs are from their debut album, Horehound, and the other three are non-album b-sides, including some cool covers of Gary Numan and Them. Jack also plays on most of the singles, including Rachelle Garniez’ “My House of Peace," The Dex Romweber Duo’s "The Wind Did Move” and “Last Kind Word Blues," Dan Sartain’s “Bohemian Grove”, " Smoke Fairies’ “Gastown” and “Riversong” and Wanda Jackson’s “Shakin’ All Over” and “You Know I’m No Good.” He even gets a solo cut with his on the spot creation, Fly Farm Blues, from his involvement in the It Might Get Loud documentary. Before Karen Elson recorded her full length album, she cut an interesting single under the name Mildred and the Mice called “I Like My Mice (Dead).” The two songs that are the most outside of the box, yet somehow still perfectly within the Third Man realm, are probably “Afterparty” and “A Glorious Dawn.” “Afterparty” is an incredible 70’s era funk/disco fusion song recorded by Transit, a band made up entirely of employees of the Nashville Metro Transit Authority. “A Glorious Dawn” is an autotuned creation containing samples and clips of Carl Sagan and Stephen Hawking and opens with the line, “If you wish to make an apple pie from scratch, you must first invent the universe.” Whether it’s alternative music, piano ballads, rockabilly, garage rock, Solid Gold funk, or the blues, Third Man can find the bands who are doing things well and doing things differently. 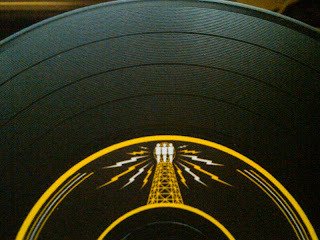 Third Man’s flair for the unique even factors down to the packaging, as the cd was made to look and feel like a vinyl record. With this year being filled with great, original releases as well, one can only hope there will be a Volume 2 released at the beginning of next year.